← In memory of James Garner, why not consider a Maverick approach to DC-advocacy? Think the AMS doesn’t speak with one voice? Here’s how Dr. Boehnert describes the graphic: The poster illustrates relationships between prominent actors and major organizations participating in climate communication. These include: science institutions, media organizations, think tanks, government departments, non-governmental organization (NGOs) and individuals – along with some of the more significant funders. Actors are situated within four discursive realms: climate science; counter-movements (contrarianism); ecological modernization (often neoliberalism); and social movements (climate justice). These four discourses are mapped on a framework wherein actors are colour-coded according to where they are situated. In this first version the colour, the size of the circles and their positions are all speculative. Subsequent versions will use different methods for plotting the actors and linking the nodes. Looking for the AMS? It’s the (rather small, and focused) dark grey circle just a tad above dead center in the “climate science” discursive realm. Her website’s original visual provides a magnifying cursor that will help you explore. Those inside the AMS 13,000+ member community might say, “Wait a minute! I know my fellow AMS members, and they’re scattered all over the diagram, from Naomi Klein to Jim Hansen to Sarah Palin to Al Gore (all represented as dots on the figure).” But Jodi Boehnert’s diagram captures much of how the outside world sees our institution; and that external, much-broader and more diverse public sees us as more narrow-spectrum than we might see ourselves. The graphic is thought-provoking and merits reflection and study. You’ll find other great visuals on communication of climate and environmental issues on her blog. Their creator tells us these depictions are works in progress; you might want to give her some feedback and encouragement. Dr. Boehnert is early career. The forecast? We can expect great things from her in the years ahead. 2 Responses to Think the AMS doesn’t speak with one voice? 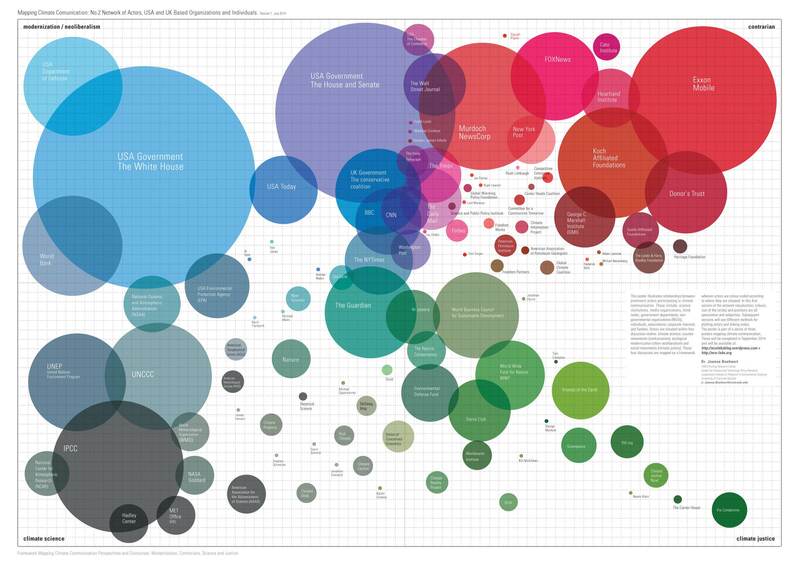 If the circles were sized according to the amount each spent on climate change, I suspect Exxon Mobil would end up only slightly bigger than the AMS. Frankly, I think Big Oil isn’t as worked up as the Alarmist cultists usually portray it to be. Interested – sure. Spending money to lobby against measures that could harm their business – sure. But beyond that, we have BP investing in several science ventures that aim toward an alternative energy future. Even Exxon Mobil – the cultists’ “Monster in the Closet” – has had a flourishing (multi-million dollar) biofuels program. I look forward to a revised diagram based on more objective criteria. For example, let’s use contextual analysis to determine who’s communicating what semi-quantitatively. Or look at budgets and balance sheets to determine who’s spending what on what. And let’s do it as scientists – hypothesize if you want, but be data-driven in the conclusions. Points well taken. I hope you’ve noted that Ms. Boehnert advises her figures are works in progress. I think she’s looking for feedback like this. Ihope you’re visiting her website and passing along similar comments directly.